Free Shipping to the Contiguous USA and Canada. Program features wash phase at 150 degrees F (65 degrees C) and final rinse phase at 185 degrees F (85 degrees C). Warranty is 1 Year for Parts and Labor on Jet-Tech Appliances. Extended Warranty is available. 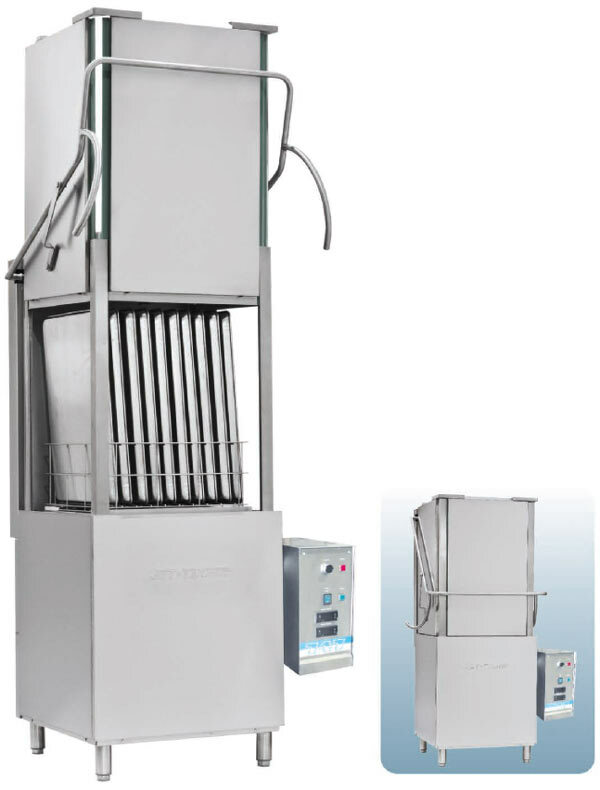 Completely automatic wash and rinse programs with a wash cycle of 150 degrees F (65 degrees C) with detergent and rinse cycle of 185 degrees F (85 degrees Celsius). Ideal for Retail and In-Store Bakeries, Delicatessens, Convenience Stores, Schools, and Pizzerias. Rack Capacity: 19.75" x 19.75"
Wash Temperature: 150 degrees F.
Rinse (booster) temperature: 185-194 degrees F.
Power supply: 208-240 volts / 60 Hz. / 1 or 3 phase (please specify prior to ordering) Single Phase: 50 amps. Three Phase: 37 amps. Water supply: 1/2" hot water supply 140 degrees F.